Due to circumstances beyond their control, the Let’s Dine Out Show had to cancel this Sunday’s dinner at Upland Kabob. 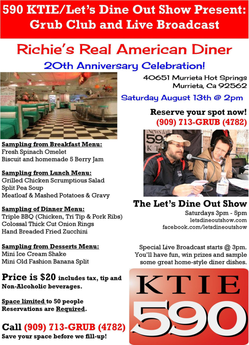 However, they’ve already announced the next outing at Richie’s Real American Diner, 40651 Murrieta Hot Springs Road, Murrieta. The event will begin at 2 p.m. August 13 and will include samplings from Richie’s breakfast, lunch, dinner and dessert offerings. The cost is $20, which includes tax, tip and non-alcoholic beverages. It will also be a live broadcast for the Let’s Dine Out radio show. Seating is limited to 50 guests, and as of this writing, about a third of the spots are already reserved. If you want to join Allan Borgen and Jeff Williams and the rest of the crew at Richie’s, call 909-713-GRUB (4782) to reserve your spot. This entry was posted in Murrieta by John Plessel. Bookmark the permalink.